The ME-RC is designed to be simple to use while offering multiple functions in one place. Easy-to-read: The large LCD screen and at-a-glance LEDs display the inverter / charger status in a straight-forward way. Soft keys give simple access to menus and a rotary encoder knob makes it easy to quickly scroll through menus and select settings. Non-volatile memory: Critical settings are saved even if the power is disconnected. 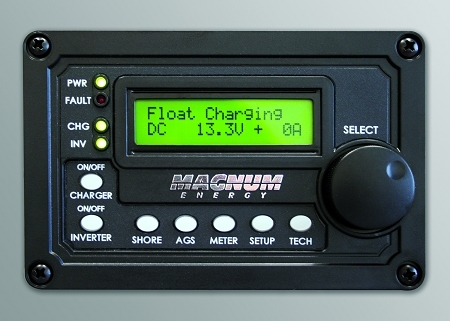 No cross platform confusion: The ME-RC remote is the same remote used on all Magnum inverter / charger models in the ME, MS, MS-PAE, RD, MM, and the MMS Series lines. Multiple functional settings: The ME-RC offers multiple functions in one place, including: inverter on/off, charger on/off, shore power breaker settings, AGS control, meter button, simple setup, and technical menus. A standard 50’ 4-wire, twisted pair cable allows for plenty of room to display the Remote with ease.